Nearly 80 students from Jerome competed at the Ohio Leadership Institute’s Ohio Model United Nations showcase Dec. 7-9. The Ohio Model United Nations is a global education experience that allows high school students to learn about the United Nations and its role as the world’s largest international peacekeeping and humanitarian organization. Jerome had 10 teams at the conference, representing the countries of Cyprus, Ghana, Lithuania, Cote d’Ivoire, Slovakia, Albania, Barbados, Algeria, Kazakhstan, and Niger. Students on the Albania, Slovakia, Ghana and Cote d’Ivoire team were recognized for Outstanding Resolutions. Students on the Ghana team were recognized for Outstanding World Health Resolution and Kazakhstan was recognized for Outstanding Nation. In the Model UN program, students work in teams to research global issues of a specified nation, propose a unique resolution for its respective nation and the resolutions are debated in councils of about 200 people, and also in the larger General Assembly of more than 1,000 people. There are two rounds, which are scored based on a rubric that not only details the quality of their resolution, but also their presentation. This year, the Ohio Model United Nations was the largest in the nation, with more than 1,500 students on more than 200 teams, gathering in the Greater Columbus Convention Center. “We are very proud of our achievements this year and especially thankful to our school advisers Mrs. (Katie) Longwell and Mrs. (Karen) Kendall-Sperry for making this possible,” he said. Kaza and co-president Sarah Han, won Outstanding Leadership awards at the conference. 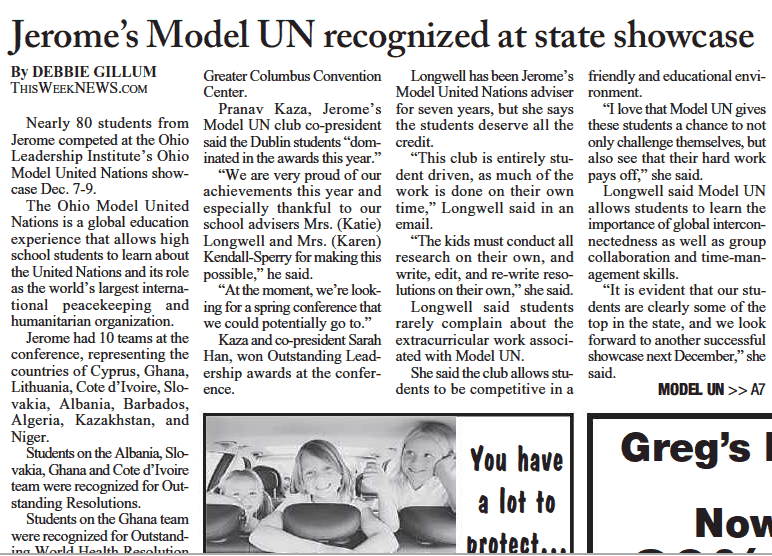 Longwell has been Jerome’s Model United Nations adviser for seven years, but she says the students deserve all the credit. “This club is entirely student driven, as much of the work is done on their own time,” Longwell said in an email. “The kids must conduct all research on their own, and write, edit, and re-write resolutions on their own,” she said. 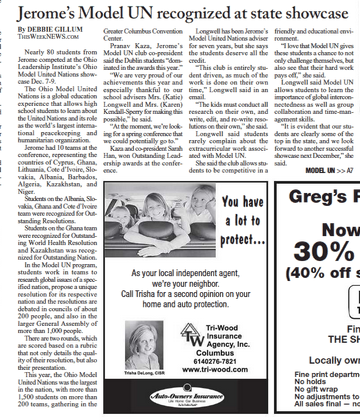 Longwell said students rarely complain about the extracurricular work associated with Model UN. She said the club allows students to be competitive in a friendly and educational environment. “I love that Model UN gives these students a chance to not only challenge themselves, but also see that their hard work pays off,” she said. Longwell said Model UN allows students to learn the importance of global interconnectedness as well as group collaboration and time-management skills. “It is evident that our students are clearly some of the top in the state, and we look forward to another successful showcase next December,” she said. Model UN teams have the option of performing a talent that is reflective of their country’s culture. If they choose to perform a talent in the “Cultural Presentation,” they can be considered for a Cultural Presentation award as well as the “Outstanding Nation” honor. The Cyprus team was selected as the runner-up for the cultural presentation competition for creating a remix to Ice, Ice, Baby called Cyprus Baby with lyrics representing the culture of Cyprus. Simon Zhuang, Rohan Prabhu, Matvey Yang, Derek Wang, George Chen, Hannah Lee were elected as next year’s student leaders for the Ohio Leadership Institute’s Ohio Model UN Showcase.